Shibahara Hironori (part of the editorial staff at the Dengeki Hobby Magazine): Currently, there are things that people “don’t want to acknowledge” publicly or privately about a number of Original Mobile Suits. I’d like to talk about that today. But before that, what do you suppose is the definition of “official”? Horiguchi Shigeru (producer at Sunrise, worked on Turn A, SEED Destiny, 0080, and Gundam Evolve): I count whatever’s in the footage as official. Watanabe Toshihiro (works at Shindosha, a design office known for their mecha designs of Zeta Gundam and Gundam ZZ): We can roughly split the setting into three levels: White (official), grey, and black (lies). Okazaki Akiyuki (writer): There are also “unusable” parts of the documents we use to make the setting, like how “the Rick Dias can enter the atmosphere” (1), which is part of what Sunrise “oversees”, if you want to put it that way. Morita Akihiro (another producer at Sunrise): That was produced for the comic, wasn’t it? Shibahara: But does that count as official canon? Watanabe: Regardless of whether it’s part of the formal mythology or something that Sunrise oversaw, the basis of what counts as “official” is whatever is in the footage. Okazaki: What about footage for the games? Watanabe: They’re just game demos. At the start of Gihren’s Ambition (henceforth, Gihren), Ramba Ral gets off at New York, but it’s stated when he appears in Gundam itself that it’s his first time coming to Earth. Shibahara: I think that Gihren has had a lot of influence. There are many people who are convinced that parts of Gihren as canon even when they’re not shown in the official material, except for the parts that are obviously “non-canon”, of course. Ushimura Norihiko (producer at Bandai Games): From what I understand, the One Week War and the Battle of Loum at the beginning grabbed players’ attentions in particular. Horiguchi: No matter how convincing it is, Gihren is simply a “what if” story. I’d like people to take it as a “picture that’s come to life” or a “film that was made after the war”. Something like that. Okazaki: There are also problems in what appears in Sunrise’s footage. “Mobile Suit Gundam: More Information on the Universal Century” (2) was so problematic that you should take it as “rumours about what happened on the battlefield”. Shibahara: The Gundam Ground Types were only ever criticised at first. Watanabe: The real problem with The 08th MS Team was that there were already GMs around the time of “Gihren’s speech”! Shibahara: It’s explained that the speech is a video broadcast and that they were sending test models into battle. Okazaki: Gundam Ground Types are also mass-produced in this setting. Horiguchi: Yeah, GMs weren’t being mass-produced at this time. Shibahara: Anyway, everything in the games is considered grey. Watanabe: No, everything not shown in the anime is grey. 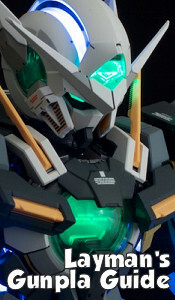 It’s just that the cool things from the games got turned into Gunpla models. Katagiri Keiichiro (designer): Like Char Gundam. (3) Gihren is black, which makes it interesting. Kano Yoshihiro (works for Bandai Hobby): This (i.e. Char Gundam) is very black indeed. Horiguchi: The models are fun to play around with because they’re not canon. Watanabe: It’s an excuse to bring out the Gyan Cannons. Kawaguchi Katsumi (works for Bandai Hobby): That’s clearly black as well. Watanabe: The canon part of the setting is that Gyans and Gelgoogs are in competition, and lots of people play around with what-if scenarios, which flips the setting on its head. Shibahara: What I can’t accept are the “High Mobility Type Gyans”. If they just exchanged their backpacks for mobility like the High Mobility Type Gelgoogs do, it’d be more believable. Kano: Mobile Suit Variations and Gihren are a twist on the original setting, which puts them half in the grey zone, half in the black zone. For that reason, the things we (the Bandai Hobby department) develop are simply grey. (1) A comic published in Gundam Magazine (Kodansha) had an episode about this. (2) Supplementary footage to the The 08th MS Team OVA series. It shows short clips about the Gundam world. (3) A mecha unit that appears in Gihren’s Ambition. When Char founds Neo Zeon as Casval Deikun, it’s possible to pilot a Char Gundam. Its proper name is the Casval Custom Gundam.